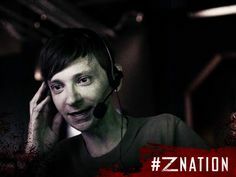 Zombie-nado and Citizen Z are from "Z Nation" because season 2 starts tomorrow night. LOL! I like the name Bidi-Bot better...but Robo-Girl will work! That's just her super hero name, like Bidi's super hero name is Super Cannibal Girl. I thought she ate clams? Funny, but reminded me of Sharknado. Can you believe there actually is a Sharknado 2? How did they get money for a sequel? My apologies if you are one of the people who liked it. There must be some somewhere. They must be the same ones who keep reality shows going. Poor Bubby and Sissy can't catch a break and end up completely dead no matter what happens. Yeah, and there's a Sharknado 3 too, made by the same people, SyFy Channel, that made Z Nation. Pretty funny if you're in to that cheesy stuff. I'm not the biggest fan but when there's a month until The Walking Dead comes back it will do. Blowing up every thing she sees does not make Bidi an explosives expert. Be sure she blows up what you want blown up. But she did get to level 2 sapper in that game she was playing. Zombie-nado...I think Id like it better than shark-nado. The potential. I see t-shirts :-) also I'm glad Bidi gets to blow up something again soon...hopefully it'll be a big one! Zombie-nado + chainsaw = a whole lot of fun! Uh,Bubby,I don't think we're in Kansas anymore! And where did the ruby slippers come from? I'm also enthralled that Bidi-Bot is actually day-dreaming. most unexpected for the worlds most advanced computer processor!
" I'm also enthralled that Bidi-Bot is actually day-dreaming. " Let's not forget that Bidi-Bot was put together by Bidi. So it should be expected that Bidi-Bot would have some quirks. Well that super computer was made in Canada so it's to be expected. They just have some serious bad timing. Z nation is my beer night on the couch show. Bubby and Sissy are Zombie LEGENDS! The pole dancing bit was hilarious! That last panel...wow. I love it! Wait... Is that "Mum" zombie I see in the background, reaching for her hat? I thought Bidi grabbed Mum's jewelry before colony girl put a slug between her eyes. Or is there more than one Mum zombie wearing an almost identical outfit? Another thought: Wouldn't a big tornado make for a decent way to spread the nanobot cure? Busted! This is why The Walking Dead wins Emmy awards and Whiteout doesn't. TWD would never get caught recycling zombies.